We are ready for Odoo 12, are you? Odoo is here with its latest version that is ‘Odoo 12’ with tons of new features. The Odoo developers have done some great work and the outcome is beautiful to see and effective to work with. Various Odoo 12 apps have been augmented with small and big changes including new features. Quite a lot has changed to make your tasks easier. Take our word it will leave you awestruck. One of the newest feature of Odoo 12 is the look of the dashboard. The Dashboard interface for Odoo 12 has been improved to look highly user-friendly and compact. The navigation panel for each module is also now, at the top of the page in Odoo 12 as compared to left in Odoo 11. The menus have been divided into groups and subgroups to allow faster navigation. Odoo 12 also provides a new and improved progress bar Dashboard which lets you to quickly configure the modules like sales, accounting and invoicing etc. Stock operations are now represented by acoustic bloc diagram in Odoo 12 Inventory App. Check the stock operation for a particular product or for an order. Don’t dive through the endless list of products and their multiple variants while creating quotation in the Odoo. 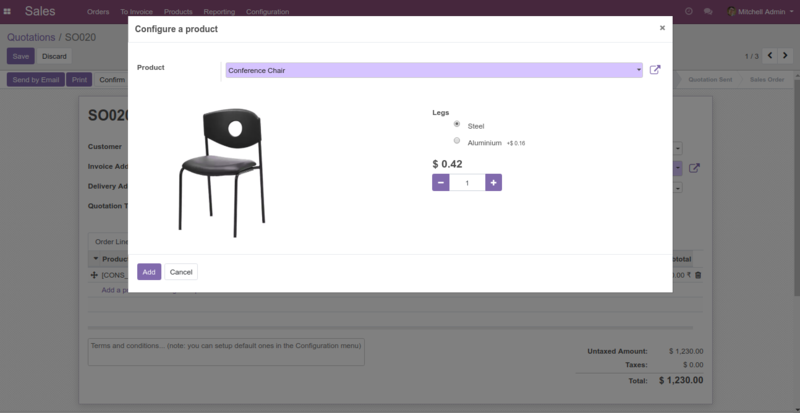 Website Product configurator is now available in the Odoo 12 Sales module. Add the products to the order lines with the desired attributes in seconds with a click. One of the most anticipated features of Odoo 12 is Multiple websites support. The users can now create multiple websites in the default Odoo configuration of website module. In the previous version, this was done using one of the best selling module- Odoo Multi-Website module. Odoo 12 lets you add a note to each order line in a sales order without integrating any 3rd party module. Now, navigate the Odoo 12 with Keyboard shortcuts and ‘Release the mouse’. Press and Hold Alt key on your keyboard to display the shortcut menu. Need to track the expenses for individuals or company? Behold the Expense App. The Odoo 12 App for expenses is much more flexible now. It now allows you to attach bills, receipts etc to the expense record. No more flicking between screens while running those numbers. Track the expenses to make wiser decisions. Odoo 12 now supports right to left script direction without any third party configuration. This simple feature makes the Odoo ERP highly flexible for people working with languages which are written from right to left like Arabic, Hebrew etc. Now, choose from different template layouts to send quotation and invoices using the progress bar. The user type has been merged into a new field. Now, the admin can set Odoo user as an Internal user, Portal user or Public user in the Odoo backend. Whether you are planning to migrate to Odoo 12 or setting up a fresh database, we can help you in setting it up. With years of experience in developing plugins for Odoo and providing customization solutions for different clients from around the world like (ITC), Edututor, GoSupps, GreatEarth and many more, no one does it better than us. We have already upgraded most of our modules/apps to Odoo 12 while others are already in the queue. If the module you are looking for is not yet available for Odoo 12 then no need to worry, you can simply purchase the module and we will upgrade it for you. So, maximize the utilization of Odoo 12 with Webkul Odoo 12 modules. For any queries or customization requests regarding Odoo 12 or any of its previous versions just drop an email to our support team at support@webkul.com.